Nitrogen (N) fertilization is one the most widely used agricultural practices and crops are known to utilize only 30 to 35% of the applied nitrogen fertilizer. Every year non-ignorable total sum of nitrogen lost with volatilization to the air, leaches from the soil and become not useful for the plants. As the technological advancements, attention has been focused on studies to measure nitrogen loss and maximize plant nitrogen use efficiency. A practice commonly recommended to improve nitrogen fertilizer use efficiency is the addition of urease and/or nitrification inhibitors into nitrogen fertilizers. Urease inhibitors delay hydrolyzes of urea fertilizer and thereby decreases ammonia volatilization; nitrification inhibitors delay the conversion of ammonium to nitrate and lowering nitrate leaching. Usage of nitrification inhibitors inside DASH 21 reduce nitrate leaching by keeping the applied nitrogen in ammonium form, which can be hold by soil with Cation Exchange Capacity. Dicyandiaminde (DCD) is a well-known nitrification inhibitor used in DASH 21 that studied in a wide range of crops. The DCD inhibits nitrosomonas bacteria and stopping the oxidation of NH4+ to NO2-. As a result slowly released nitrate from ammonium can be taken by plant without leaching and unwanted nitrogen loss prevented. 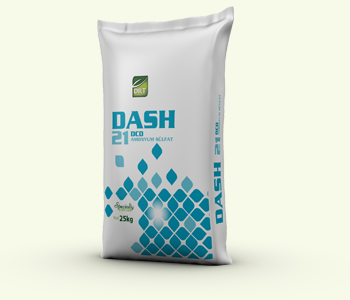 With DASH 21 yield can be increased with the same amount of fertilizer rate. Yield can be maintained with less fertilizer rate. Yield can be increased more than average by increasing fertilizer rate. *compared to traditional ammonium sulphate fertilizers. Nitrous oxide is emitted from agriculture, transportation. In agriculture oxide is emitted when people add nitrogen to the soil through the use of Nitrogen fertilizers. When nitrogen contained fertilizers applied to the soil, depends on nitrogen type and quality, most absorbed by plants. The rest volatiles or runs off into waterways. Nitrous oxides go to the atmosphere and enhance the greenhouse effect with a global warming potential 298 times greater than of carbon dioxide (CO2) in a 100-year time horizon (Forster et al. 2007). 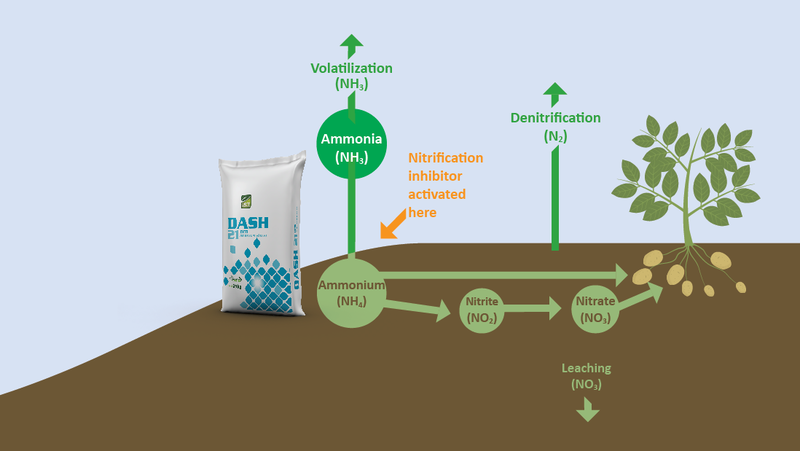 Nitrification inhibitors such as Dash21 contain help to hold nitrogen longer in soil, providing more opportunity for plants to uptake. The usage of nitrification inhibitors can reduce greenhouse gas emissions (e.g., Abbasi and Adams 2000; Di et al. 2007, 2009).